"Facilitate analysing a series of poker game variants"
The product presented here is called Poker Analyzer. Poker is a game often played for money and nowadays online poker tournaments are fairly popular. Now, here’s a poker odds calculator, a universal poker assistant that might facilitate improving your poker insights by accurately analyzing poker situations. 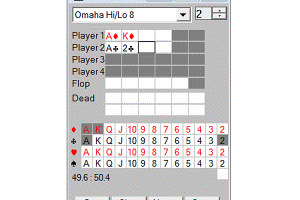 Poker Analyzer includes various poker game variants, such as Texas Hold’em, Omaha, Omaha Hi/Low, 7 card stud, 5 card stud, 7 card stud Hi/Low, Hold’em Hi/Low, Omaha 5-card, Omaha 5-card Hi/Low, Hold’em 3-card and Hold’em 3-card Hi/Low. Basically you’ll select the type of game, the number of players, cards and flop and Poker Analyzer will do its magic. So, if interested in finding out more details about this application's features and functionality, consider proceeding to the demo download so you can start evaluating it today.